In a small classroom adorned with colorful paper sheets, students seated on beaded mats loudly pronounce the alphabet of the English language. For many, it is the first time that they are studying the letters and words of a foreign language. For others, it is the first time that they are actually studying. One of them, an 18-year-old girl, who back home was not allowed to go to school by her parents, considers her stay at the relief camp a blessing. Over time, stories of the plight of flood victims and their miseries have moved off the front pages of newspapers as disaster fatigue sets in. But the fallout of the devastating floods cannot be wished away and will have a huge impact in the coming months and years. Beyond the immediate problems of food, water and shelter, the underlying psychological problems that children growing up in the camps will eventually face is bound to have a huge impact. Witnessing your house being washed away by a tide of water and seeing your parents begging for food are not the kind of scenes a three- year-old should witness at such an impressionable age. "Although the raging floodwaters have destroyed my home and rendered me homeless, I am happy that by coming here, I have got the opportunity to learn something. It was here that for the first time I came to know what a classroom looks like and how students are taught. And now, I don't want to go back home," said a determined Gula. At the Razzaqabad camp for flood victims, one of the largest of its kind in Karachi, a majority of the dwellers are reluctant to go back home. While some people are glad that they are getting three square meals a day, as well as education and vocational training, the others feel that going to their native villages is useless as the deadly floods has swallowed up entire villages, completely destroyed the infrastructure and reduced their homes to mere debris. A bearded Maula Baksh says, "Officials keep on asking us to leave the camp, but by doing so we would be luring ourselves into a deathtrap. The water has still not receded, and there is no trace of our houses. The agricultural fields we worked in are completely submerged under water. How can return to our native towns?" he questioned. Baksh's statement not only echoes his family's stance but also of the several families which are residing in the camp. While the colossal damage caused by the calamity remains the main reason why these people are unwilling to return home, other reasons such as getting freedom from discriminatory tribal traditions and running away from debts and loans is making them think twice about returning home. Father of five children, Qurban Ali, admits that he is deliberately not going back as he would not be able to pay off the bank loan which he took for building his house. "Now, I don't have a house or a livelihood. The floods destroyed the house I was building and my livestock was swept away. I cannot repay the loan and therefore I am staying here." But not everyone is unwilling to return home. A teacher at the camp's makeshift school, Darya Khan, has made up his mind to leave for Thul, his native town next week. "I believe that we should all go back and rebuild our houses and villages, and start life again. The people need to understand that they cannot be dependent on others for their livelihoods and need to return one day to their homes." Sitting on the scorching ground outside her tent, an elderly Mai Hajra agrees with the school teacher. "My heart is where my home is. We all should go back and start all over again. I have been living in Thul for the last 70 years, I was born there and I want to die there. Thul is meri maa," she said, her eyes welling with tears. An angry 20-year-old painter hailing from Jacobabad said that it is better to go back and starve, rather than to live like animals in the camps. "There is a huge water shortage and our children are crying for water. Also, the system of sanitation is very poor. The washrooms haven't been cleaned for the last three days. We are being treated like animals, and I am going back even if I don't have anything with me." The halt in distribution of Watan Cards at the relief camp, the government's compensation to the affectees which entitles each family to Rs 20,000, has also emerged as one of the factors forcing people to prolong their stay. A dweller said that they are waiting for the Watan Cards after which they would head back home. Another said that once they get hold of the card, he will stay on in Karachi. "Back home, there is nothing left to go to, and therefore I am looking for a rented place here in the metropolis. The job market is huge and I will be able to provide a better living to my family here." Meanwhile, there were also those who went home but returned to the relief camps due to the conditions there. Firdous, who went back to his hometown Sultan Kot after Eid, has this to tell Kolachi. "Knee-deep water is still standing in many areas. Along with razed houses, I also saw corpses of humans and animals lying there. Meanwhile, the shortage of commodities in the affected areas has led to a sharp increase in prices and I was shocked at the price hike. Back home, one kg flour is being sold for Rs 100 per kg, one kg of sugar for Rs 130/kg and onions for Rs 80 per kg. Seeing the disastrous situation, I came back and have decided to soon relocate to some place in the metropolis." A widow, very aggressively said that even if the Army comes in and forcibly moves the dwellers out from the camp, they will not leave and instead will fight against them. "Even if tear gas is used, we will not go home. Some people, due to fear of the officials, have left the camp but we will not go. There is no one to look after the children, and now with damaged fields, how will I feed my children?" she sobbed. According to the DDO Revenue Shah Faisal, Attaullah Norio, who is also in charge of the camp, people are slowly and steadily going home. "The cut-off date for leaving the camp is October 10 but I think we will exceed that deadline. Around 1,000 people have left and 6,000 people still remain, and are allowed to stay here till the time they want to." The Executive District Officer of the Revenue Department, Roshan Shaikh, claims that nearly 20,000 people have left the relief camps and are heading back to their homes, whereas some 67,000 people are still staying at the City District Government's Karachi relief camps. However, Manzoor Nawaz believes that a large number of the Internally Displaced People will continue to live in the metropolis. 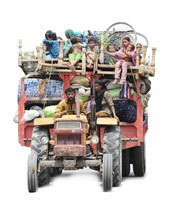 "Since people are getting facilities which they never had back home, they are likely to stay back. You can't blame us for not returning. We come from villages where the situation of health and sanitation is much worse than at the camps. Having chicken Biryani, every night is a blessing for many. Meanwhile, those who have seen the deadly waters taking their loved ones and damaging their homes are so terrified that they don't want to think about leaving. Here, people are sharing their loss with one another and have forgotten their backgrounds and tribes." Smiling, he walked off and entered the next-door tent for a chitchat with his newly-found friends. Psychiatrists believe that if not taken seriously, the generations growing up in these camps can be potential outlaws, as the trauma of displacement is very lethal and the affects everlasting. "The first thing that comes after such a catastrophe is loss and it is not only a loss of resources but also a loss of identity. But in the case of the flood victims , people who never had an identity have got an identity and are now known as 'flood victims', which is a major issue, " says Dr Ali Vasif , Consultant Psychiatrist at Ziauddin Hospital. Dr Vasif believes that the people in camps had within themselves the sense of being Baloch or Sindhis or many other ways that they used to represent themselves. But this collective term has not only killed the individual within them but also given them a chance to consider themselves as sufferers which breeds helplessness. Psychiatrists believe that a decade from now, a village boy who grew up in a relief camp and a common boy or girl from the same socio-economic background whose area was spared by the floods will be quite different from each other in terms of behavior and traits." The generation that is growing up in these flood relief camps will be far more insecure, sensitive, more aggressive and more vulnerable to any kind of change and above all, more uncertain about all the things happening around him as compared to a normal kid of the same background and age," Dr Vasif told Kolachi. He was of the opinion that understanding the factors that will lead to such behaviour is no rocket science. The images that we see on TV, of how the already suffering victims are standing and begging for food and being brutalised by the police and security agencies if they fall out of line, speak for themselves. If someone has an empty stomach and gets beaten up, you are killing the very few human elements left in them and in turn forcing them to behave reactively instead of being proactive. Explaining the complications involved in such cases Dr Vasif explained that when someone burgles your house, you are in an immediate state of confusion and loss is the primary cause of depression and anxiety. In this case, it is not a theft in the house but a sudden disappearance of your house, which is a pretty difficult image for a young mind to manage. However, there are other disturbing factors at work too. Some people who never had anything in life are being served with food three times a day in camps which, according to Dr Fouzia Khan a practicing psychologist and educationist, is what will lead to greater loss." Many of the people in the flood camps are those who haven't even seen a city in their lifetime but suddenly they are getting all the things they ever wanted. This could become the primary cause of crime because many people in the camps will consider begging their right," Dr Khan told Kolachi. Further explaining the issue, she said that any disaster recovery can be divided into four phases. The first one is the 'heroic phase', where the victims fight the calamity and reach shelter, the second is the 'honeymoon phase' (the current phase in many flood victims' lives) when the victims are fed with food and given shelter which they begin to enjoy. Next comes the phase of 'disillusionment', when the community and survivors get tired and get overstressed by the ongoing recovery efforts. But the problem arises in the final phase which is 'rehabilitation' because the people will not be able to rehabilitate themselves as they have been made too much dependent on external assistance. "Feeding people three meals a day might work in the initial phases but I think it is better to give them food once a day; no one dies if he or she has food once a day. It would be preferable to give them some work to do if they want to earn a living or have three meals a day," Dr Fouzia told Kolachi. Further supporting her argument, she said that a whole new generation would come out of these flood camps and the pampering attitude towards them needs to be changed, if people want the kids in these camps to progress and turn into healthy individuals. "We are an emotional nation and we care but if we really want to care then we better provide them with vocational training institutes and hold them responsible for their families at least, because if the urge to stand and work for oneself dies today, one won't care about anything tomorrow," suggested Dr Fouzia. Dr Vasif compares the current state of Internally Displaced Persons (IDPs) camps to a jail, where people live under a single roof and get food and water but there is no progress in their lives. "The IDPs camps right now are no less than jails. The children living in them will get more aggressive and anxious over time. However, the whole flood scenario and whatever they have seen at such a sensitive age can be utilised as something positive only if proper social rehabilitation takes place," shared Dr Ali. Poverty leads to crime and eventually if proper social rehabilitation is not started after a couple of months then these children will not be able to draw a line between right and wrong and could turn into criminals. That could be the bigger catastrophe of all. However, psychiatrists in general want the authorities and other medical units not to set up mental health camps as they were helpful in situations like the earthquake where there was a great loss of life and people needed immediate counselling. They emphasised the need for creative outlets for kids and vocational training centers for women so that there high adrenaline rush and sensitive emotional state could be channelised in a positive manner rather then the nightmare scenario of children turning into virtual savages and stoning each other over a bag of ration.